Oregon Health & Science University is about to become a nationally recognized imaging center. 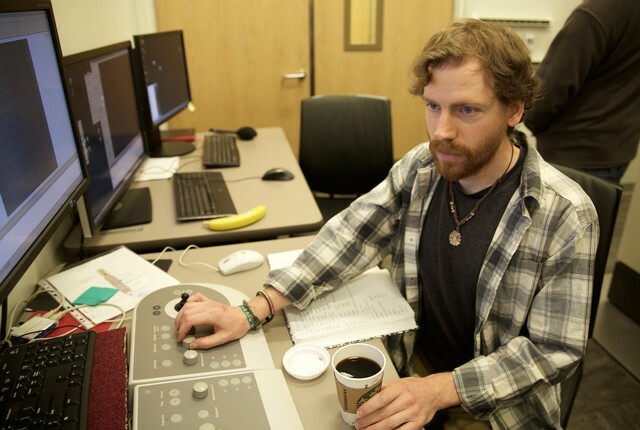 The teaching university just won a grant with the Pacific Northwest National Laboratory to install four new cryo-electron microscopes. 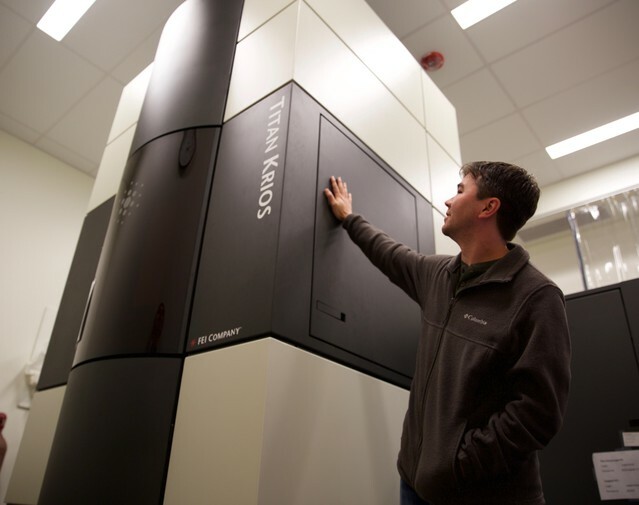 The National Institutes of Health is paying $128 million to build three new cryo-electron microscope centers around the country. One will be at OHSU in Portland, the others will be at Stanford University and the New York Structural Biology Center. The microscopes are so powerful that scientists expect them to revolutionize the study of structural biology. The three scientists who developed them won the Nobel Prize in chemistry for their work in 2017. Rather than a flat two-dimensional image of molecules, these microscopes produce three-dimensional images that can be rotated around a computer screen. The images, at magnifications of 150,000 times actual size, look like a symmetrical pile of spaghetti, where each wiggle is clearly visible. Greg Martin, a student in the Biochemistry and Molecular Biology Graduate Program, works on an older version of the new cryo-electron microscopes.
. He’s using an older version of the microscope at OHSU to study the structure of the drug Glyburide. It turns out the drug acts on a protein created by the pancreas. Martin is using the cryo-electron microscope, or “Cryo-EM” for short if you’re a scientist, to capture images of both that protein and the drug. The goal is to see what actually happens when they interact. Martin is growing cells containing the protein in a petri dish, then breaking up those cells and isolating the protein. It’s as if the mixture is alphabet soup, and he’s trying to isolate all the “A” shapes. Once he’s done that, he flash freezes all the As in what are essentially little ice cubes. Then the microscope takes individual pictures of all the frozen As and uses software to stitch them together. An 2012 version of the four new cryo-electron microscopes that are coming to OHSU. , a senior scientist at the Vollum Institute at OHSU. The institute is focused on understanding the mechanics of how biology works — for example what actually happens when a protein molecule reacts with a drug molecule. Gouaux said you can think of a drug as a key and a protein as a lock. A drug can turn a protein on or off. “When we study these biological molecules, using this technique of electron microscopy, we can very accurately determine the shape of the lock,” he said. The new OHSU national imaging center will attract scientists from across the country anxious to get a closer look at the molecules they’re studying. Research assistant professor Craig Yoshioka thinks there are several reasons why the NIH picked OHSU for the microscopes. First, the university has a good working relationship with the Pacific Northwest National Lab, a federal laboratory. And second, OHSU has trained scientists to use the microscopes — as opposed to having microscope expert to operate them, “One of the goals of the grant was to train, not just collect data for people, but train people how to use the instruments. How to collect good data. I think we made a very competitive argument that we’d be good at that because we’ve been doing that for a whole while,” said Yoshioka. Another reason the NIH picked OHSU might be that Oregon’s ‘Silicon Forest’ has long been recognized for businesses that need to look at extremely small things. Chip manufacturers, for example, use powerful microscopes to check the tiny gates that make-up functioning silicon wafers. The area’s reputation for imaging is likely to improve this fall with the arrival of the new microscopes at OHSU’s Robertson Life Sciences Building on the South Waterfront. That building was constructed with double walls to reduce vibration because vibrations as small as those created by a boat propeller passing nearby on the Willamette River can blur an image. 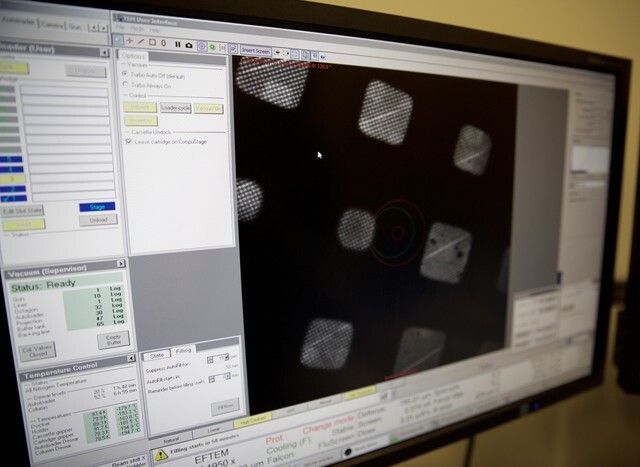 Image of the grid on which samples are frozen for viewing under the cryo-electron microscope.